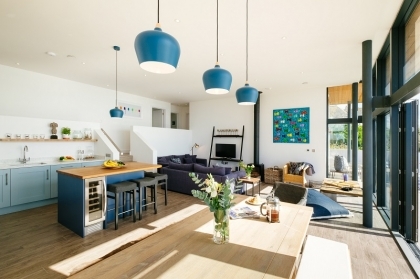 Architect designed luxury beachfront holiday home in Devon overlooking the beach at Bigbury on Sea, sleeps 8 in 4 sumptuous bedrooms, contemporary coastal interiors with a touch of Scandinavian design. With an open plan living area encased in glass, Beachfront’s design optimises the surrounding ocean views. 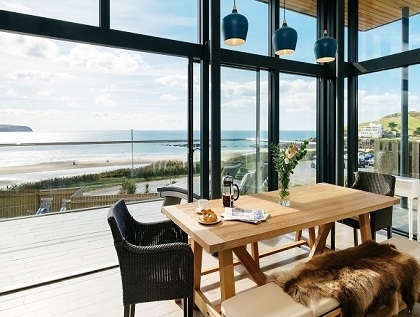 Draw back the expansive doors and revel in the relaxing delights of seaside living – from blissful mornings sipping coffee in the outdoor lounge area to family barbeques in the garden and lazy afternoons sunbathing on the terrace. A peaceful sanctuary overlooking the sea, the minimalist Master Bedroom promises slumberous nights in complete comfort. Tucked away at the back of the property, the additional bedrooms are comprised of two playful twins and a chic double. Perfect for children on rainy days, the TV room is kitted out with a Smart TV, Playstation 4 and comfy sofa bed, which transforms the space into an additional bedroom. Set just below Beachfront, the golden sands of Bigbury-on-Sea beach will keep the whole family entertained. Take a ride across to Burgh Island on the famous sea tractor, try your hand at windsurfing or indulge in an al fresco lunch at the beach café. Golfers will love the renowned Bigbury Golf Club just up the road and the nearby Sharpham Vineyard will add an extra touch of decadence to your holiday. 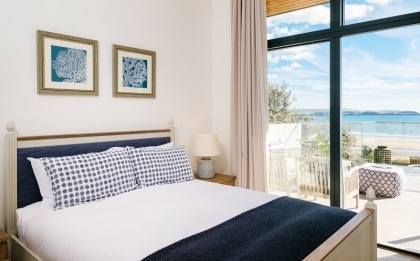 Surrounded by coastal paths and with beautiful harbour towns like Dartmouth and Salcombe nearby, Beachfront is the ideal base for exploring the South Hams. Set across one split-level floor, Beachfront’s spectacular open plan living area and minimalist Master Bedroom open onto the ocean view terrace. At the top of a small flight of stairs, the three additional bedrooms, TV Room and Bathroom are tucked away at the back of the property. 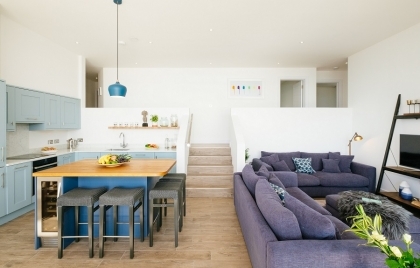 An architectural triumph, the magnificent open plan Lounge and Kitchen is the pièce de résistance of Beachfront. With high ceilings and an expansive structural glass wall, the room is flooded with light whatever the weather. The endless sea views provide a stunning backdrop and the carefully curated original artwork adds a unique character to the space. Edged in different shades of maritime blue, Beachfront’s simple and stylish hand-made Kitchen is well equipped for preparing anything from an evening drink to a three-course meal. With four wicker bar stools, a wine cooler and sleek wooden counter, the central island is set up for casual dining with a view. The Neff fridge/freezer, dishwasher, oven and halogen hob make cooking and cleaning a breeze, and there’s a separate larder for additional storage. Set just in front of the sliding glass doors, the beautifully crafted Neptune dining table and relaxed picnic-style benches have been selected with laid-back family meals in mind. With sumptuous sofas, an impressive freestanding Stovax wood burner and a trendy sheepskin throw, Beachfront’s Lounge is incredibly cosy on dark evenings and stormy days. Gather the family around the Smart TV, hot chocolates at the ready, and catch up on your favourite Netflix or Amazon Prime series. 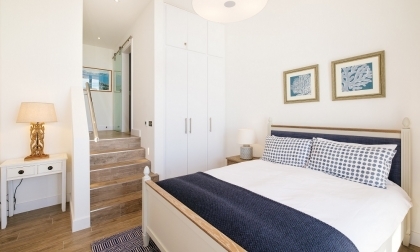 With direct access onto the terrace, the modern Master Bedroom is a true coastal oasis. Open the doors and spend heavenly mornings gazing at the sparkling ocean from the comfort of the Feather & Black king size bed. The built-in wardrobes provide plenty of hanging space and the magnificent feature mirror reflects light back into the room. At the top of a small flight of steps is the en-suite bathroom, cleverly concealed behind a sliding frosted glass door. 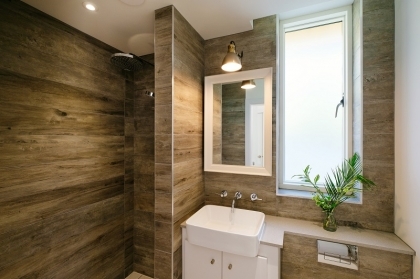 Edged in contemporary wood-effect tiles, this stylish room features a large walk-in shower with waterfall head. Located at the back of the house, Bedroom Two is a peaceful space for quiet evenings away from the group. A dramatic original coastal painting adds a touch of personality and the comfortable double bed sits just below a large skylight, which floods the bedroom with light during the day. With a large floor-to-ceiling wardrobe, there’s plenty of room for unpacking holiday essentials. Finished in gorgeous midnight blue, the adjoining en-suite includes a large walk-in shower with waterfall head. Light and bright, this pretty room comprises of wooden-framed Feather & Black twin beds. The playful coastal furnishings include beautiful framed prints, a patterned rug and large chest of drawers. The Family Bathroom is conveniently located just next door. 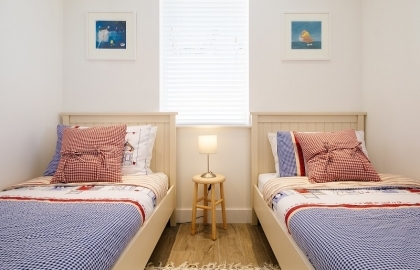 With charming seaside decor, Bedroom Four consists of wooden-framed twin beds and shares the Family Bathroom with Bedroom Three. Featuring a large double-ended Kaldewei bath, Beachfront’s Family Bathroom is elegant and practical. Enjoy spirited family bath times after sandy days at the beach, then recline in a cloud of bubbles for a moment of calm once the children are in bed. An ideal space for when the weather takes a turn, the TV Room is kitted out with a Samsung TV with Netflix and Amazon Prime as well as a Playstation 4. Doubling up as the fifth bedroom, the comfortable Loaf sofa bed sleeps an additional two guests. 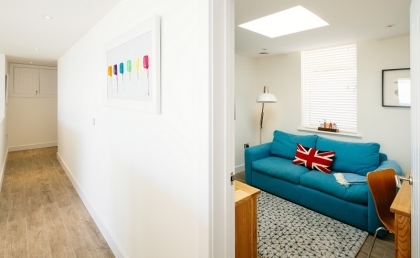 Equipped with a Siemens washing machine and tumble dryer, the Utility Room is set opposite the front door and is a great space for unloading equipment after returning from the beach. Easily accessed from the open plan living area and terrace, the handy WC is located at the back of the Utility Room.